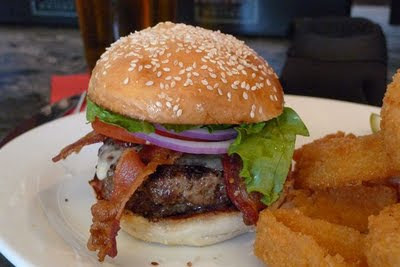 The Burger Bar recently opened to much fanfare in San Francisco. One Friday afternoon I took the crowded elevator to the sixth floor of Macy’s on Union Square. I almost couldn’t get off with the crowd waiting to get in the restaurant. I went in and noticed no one sitting at the tables, but the hostess quoting a half hour wait for a table. So I sat at the bar without waiting. There was lots to look at with a full compliment of booze behind the bar and memorabilia for sale. After perusing the menu I chose the basic Black Angus Beef Burger ($9.75). I added Swiss cheese (75 cents), Bacon ($1.15) and got it on the sesame bun. The choices of buns (6), cheeses (8) and other toppings were endless. They even offer a half lobster ($12). I also ordered buttermilk onion rings ($3.55). The burger arrived very quickly and I dug right in. The burger patty was thick and pink and perfectly cooked. It was especially light and airy and had not been over-packed like so many often are. The bacon was crisp and all the topping, lettuce onion and tomato were fresh and crisp. The sesame bun was toasted and firm, but fresh. I must say t is one of the better burgers I have tasted this year. 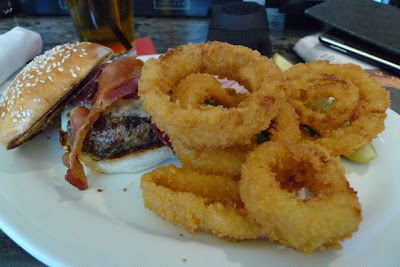 The onion rings were also fabulous. Crisp batter covered sweet and juicy onions. Next time, I think I will go for one of the many combo burgers, maybe the Rossini with Kobe beef, sautéed foie gras and truffles for $60. But more likely, I will try the Country Natural made with sustainable beef for $10.50. Wow - this review sold me - I'm going to Burger Bar! Great lookin burger and even better lookin rings. Great post! These look delicious and I think I have everything to make them. Can’t wait!!! Thanks! Oasis Double Cheeseburger always good.